Why pay $50 for a premium pack when you can get a full box with most all the inserts for less? At Monsterwax, we don't just make trading cards... we collect them. That's why we work harder to make our cards a better value. Like most collectors, we're frustrated when companies create all sorts of different levels of chase cards and include just a few in each box, forcing collectors to buy dozens of boxes to finish all the cards listed on the checklist. You shouldn't have to spend hundreds (or even thousands!) of dollars to complete a brand new series. Buying one or two boxes should be enough. It's only fair! So instead of just griping, we're doing something about it. We're beginning the "Fair is Fair" box guarantee. Every box you buy that's made by Monsterwax will contain at least one of every card from that series. (Whenever possible-- Exceptions could include when there are limited supplies like printing plates, different autographs, or one-per-pack inserts when there are not enough packs per box to finish a parallel series (e.g., the 51 card Shock Stories 3-D set when there are only 32 packs per box.)) So the bottom line is that you don't get just one foil or a couple of embossed cards with Monsterwax, but ALL of them in every single box! It's nice that other companies include a complete base set per box, but it's the inserts that make collectors buy multiple cases to finish a series. Let's hope more companies join the effort to make Non-sports more affordable for everyone. So order a Monsterwax box with confidence. Remember, even our base sets are more rare than other company's inserts! And once they're gone, they're gone for good. We strive to deliver the best value in the business. 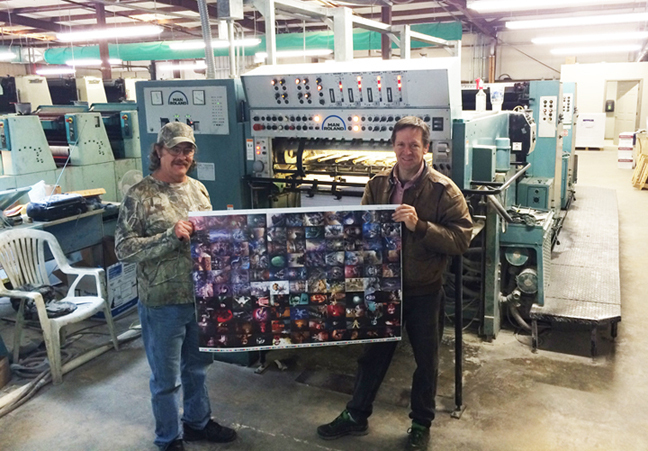 Above: Kurt Kuersteiner (on the right) checks the press sheets to insure the highest quality. EVERYTHING we produce is made in the USA, and we "farm out" (subcontract) less than any other company (that we know of, at least!) You also have our promise that no card series will ever be reprinted and is truly collectable, with low print runs from the very start.